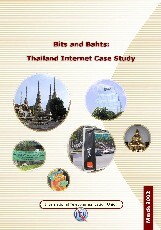 The Thai Internet market is complex and dynamic. From a regulatory point of view, archaic laws restrict the direct provision of telecom services by anyone other than two government owned organizations. As a result, the 18 ISPs in Thailand cannot have their own international or domestic infrastructure and must lease it from others. One of the government-owned telecom organizations also has stakes in all of the ISPs. Another unique aspect of the Thai Internet market is that the majority of subscriptions are pre-paid. Despite the regulatory constraints, language barriers (complicated by the fact that Thai does not use the western character set) and affordability issues (magnified by the 1997 financial crisis which the country is still recovering from), the Internet in Thailand is growing. International Internet bandwidth grew over 100 per cent in 2000. Figures for subscribers and users are notoriously variable due to problems for accounting for pre-paid subscriptions. However, even the most conservative estimates reckon that the market more than doubled to over two million users at the end of 2000 (3.8 per cent of the population). Some claim the figure is even higher at some 3.5 million users for 5.6 per cent of the population. A mission, including Michael Minges, Tim Kelly, and Vanessa Gray was carried out in Bangkok, from 20-24 August 2001. The Post and Telecommunication Department of Thailand (PTD) coordinated the mission in conjunction with the ITU regional office.